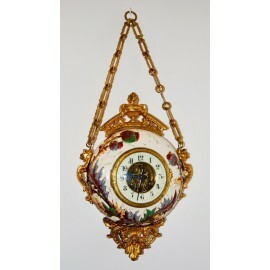 Wall clock, Porcelain and bronze, early 20th century, round in shape with embossed floral decorations and gilding on a white background. Good state of conservation, mechanics to be revised. DIMENSIONS: 58 x 10 x 26 cm. Antiques wall clock, Porcelain and bronze, early 20th century (1900-1920), round in shape with embossed floral decorations and gilding on a white background.